This week our hearts are aching for the Village Acres Farm family, following the death of Roy Brubaker in a farming accident last Friday. Roy and his wife Hope were the original founders of Village Acres Farm, now owned and operated by their daughter Debra and her wife Hannah. Despite Roy’s supposed retirement, he continued to put in long and hard hours working on the farm, as he had for the past 35 years. If you’ve bought eggs at R&R, chances are good that Roy had something to do with getting them to you. I met Roy myself only a few times, and only briefly. Over the years, though, I heard many stories about Roy, and learned that in addition to wanting to feed as many people as possible, Roy was industrious, resourceful, inventive, playful, kind, and driven by love for all of God’s creations: people, land, and critters. Perhaps most importantly to me, I learned that he was deeply loved by people who I love deeply. Roy has long existed in my mind as an archetypal small organic farmer, incredibly well-suited for his chosen profession. 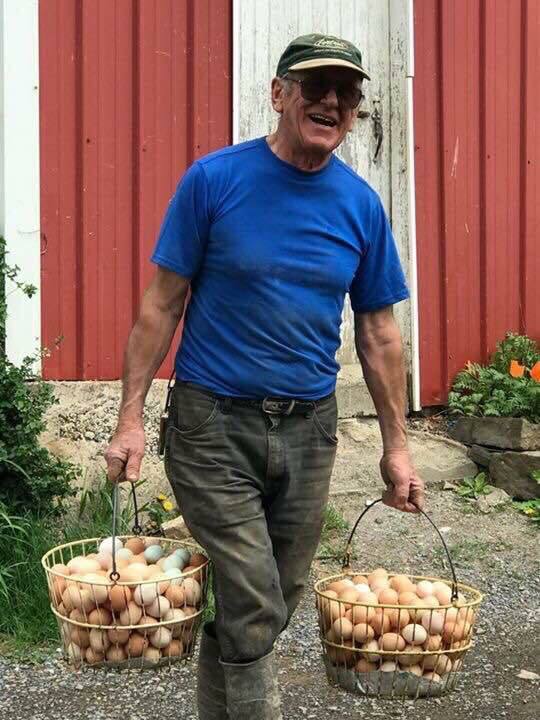 In addition to his own farming, Roy was active in the founding and early years of some of Pennsylvania’s most important organic farming support systems – the Tuscarora Organic Growers Co-operative, Pennsylvania Certified Organic, and the Pennsylvania Association for Sustainable Agriculture. I am grateful for what Roy has done for organic farming in Pennsylvania, for Village Acres in particular, and for the love he has brought to the world. In memory and honor of Roy, this week Dusty and I will be making a donation in his name to the Pennsylvania Association of Sustainable Agriculture. If you’d like to do the same, you can do so through the PASA website, or, if you’d like to add your gift to ours, just let us know at the register and we can add it to your total. P.S. You can find Roy’s official obituary in the Lewistown Sentinel here. P.S.S. Though Roy was still involved with the day-to-day operations of Village Acres, the farm has been in the very competent hands of Debra and Hannah for a few years now. Because the hens don’t stop laying and the cucumbers don’t stop ripening, and — especially — because it’s what Roy would have wanted, Village Acres brought us our normal weekly delivery of eggs and wonderful veggies from the farm this week — no worries there. Thank you for this wonderful tribute. I didn’t know Roy, but I understand the culture, and I appreciate the Roy’s of this world, and just wish I had known more.